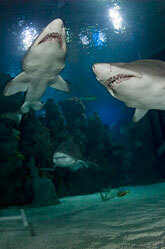 Enhance your underwater adventure at our Denver Downtown Aquarium. Join our Captain's Crew and let the adventure last all year long! *Add an immediate family member, living at the same address, to a Captain's or Admiral's Package for $29.99 per person (up to two additional members). Discounts not valid with any other offers or discounts, including Landry's Select Club.